We’d love your help. Let us know what’s wrong with this preview of A Map of the Dark by Karen Ellis. To ask other readers questions about A Map of the Dark, please sign up. An interesting book, good character study of several characters, but after reading it. I have to wonder how Elsa, the FBI agent, ever became an agent. That part of her life is not addressed at all. ? is this book available in french? Maureen Nicola wrote: "Wonderful review dear Maureen! ❤💕"
Thank you Nicola 😘🌷 Nicola wrote: "Wonderful review dear Maureen! ❤️💕"
A new series, the introduction of a new character, Elsa, an FBI agent who had a very difficult and abusive past, and is dealing with an impending sorrow in the present. Young women are going missing, and it is up to Elsa, and the young policemen who asked for her assistance, to find them. So far, so good, Elsa is an interesting character, Lex her police counterpoint on this, grows on one and cements the deal by books end. For me though, the back story of Elsa quite overtook the case of the missin A new series, the introduction of a new character, Elsa, an FBI agent who had a very difficult and abusive past, and is dealing with an impending sorrow in the present. Young women are going missing, and it is up to Elsa, and the young policemen who asked for her assistance, to find them. So far, so good, Elsa is an interesting character, Lex her police counterpoint on this, grows on one and cements the deal by books end. For me though, the back story of Elsa quite overtook the case of the missing. It was an intriguing back story but nonetheless definitely overshadowed everything else going on, very lopsided. The case itself had a plot point that was so predictable one could see it coming from s mile away, cliche I know. What happens next in the case I just couldn't quite swallow as believable. There is also one coincidence of a personal nature that felt to me, contrived. So a mixed read, but an intriguing enough of a character that it may call me back to read book two, which I am suspecting will have less of the past and more of a case. I was lost in the dark shadowy barren coulee with one of my Traveling Sisters reading The Map of the Dark trying to find cover from the demons haunting our main character FBI Agent Elsa Myers. Map of the Dark is a police procedural with a strong well-drawn character here with Elsa who really stood out for us. Karen Ellis does a good job creating an interesting and complex character with Elsa Myers. We settled in with our books and soon were taken on a race against time with Elsa as she hunts for a missing girl. Her dark past secrets start to surface and we had our guard up for those demons that were lurking in the shadow as Elsa begins to wrestle with them. We were intrigued and wanted to know more about her past however her past began to overshadow the case for us. The race slowed down and the case became a bit too predictable. However, for me, the revelation, in the end, left me shocked and clinched this one as a winner for me. We loved the dynamics between intense, flawed Elsa and her cool easy going partner Lex. We enjoyed their growing friendship and loved the kindness and understanding Lex offered Elsa leaving us wanting more from Lex. We look forward to book two focusing on him. Thank you, to NetGalley, Mulholland Books and Karen Ellis for a copy to read and review. FBI Agent Elsa Myers has a lot on her plate at the moment. Her dad is dying and she really should take a leave of absence to be with him but her mind is too full of the past and she isn't sure she can handle just sitting by his bedside. She has been requested by a young detective anyway, to assist him with an active missing teenager case so she throws herself into that investigation while dropping at the hospital as much as she can. Elsa's dad has just sold her childhood house and that house is FBI Agent Elsa Myers has a lot on her plate at the moment. Her dad is dying and she really should take a leave of absence to be with him but her mind is too full of the past and she isn't sure she can handle just sitting by his bedside. She has been requested by a young detective anyway, to assist him with an active missing teenager case so she throws herself into that investigation while dropping at the hospital as much as she can. Elsa's dad has just sold her childhood house and that house is full of dark secrets. Elsa's mother beat her regularly and as much as her dad loves her and she loves him, he never did anything to stop the beatings. Elsa needs to discuss this with her dad before he dies. Elsa was a cutter, still on the edge of cutting again at any time and her body is covered with the scars of her cutting. There is no hope of intimacy with anyone when she knows the scars of her cutting will chase them off. With all of Elsa's baggage, she actually may be able to understand the mind of the person who took the young girl...a case that grows more horrible and dire as the story goes on. Getting to see the action from Elsa's mind set was fascinating and shows how she gained the good reputation that she has as an FBI agent. I really enjoyed this book and looked forward to reading more about Elsa in the next book of the series but as I have started on the next book already, I'm not sure that Elsa is in the book. Instead it focuses on the young detective that she worked with and he's an interesting character also. A damn fine start to a new procedural series featuring an FBI Agent on the Child Abduction rapid response team. Cleverly intriguing main protagonist hiding dark secrets, excellent back up cast. creepy and atmospheric mystery element. One I'll be following along with. Full review as one of my "Ones to Watch in 2018" soon. I received a free e-copy of A Map of the Dark (Searchers, #1) by Karen Ellis from NetGalley for my honest review. Seventeen year old Ruby Haverstock disappears on her way home from her after-school job in Queens, New York. The investigation is assigned to FBI special agent Elsa Myers. Elsa specifically finds missing children and she is darn good at it. Unfortunately, Elsa is also dealing with her father's failing health. While Elsa investigates to find Ruby alive, her attention isn't completely f I received a free e-copy of A Map of the Dark (Searchers, #1) by Karen Ellis from NetGalley for my honest review. While Elsa investigates to find Ruby alive, her attention isn't completely focused as she is dividing her time and energy between work and her father deteriorating health in the hospital. Time is of the essence in finding Ruby, but many obstacles are getting in her way. Will Elsa find Ruby before it's too late. This book focuses a lot on abuse and pain, suffering and lots of emotion for. It is a tough read. This is a great start to a terrific new series. FBI Agent Elsa Myers finds missing people. She knows how it feels to be lost. Though her father lies dying in hospital, Elsa can not refuse a call for help. A teenage girl has gone missing from Forest Hills, Queens. As the hunt for Ruby deepens into a search for a man who may have been killing for years, the case starts to get underneath Elsa's skin. This is another book that features multiple points of view. It also tells about both the past and the present . Although the book is well written. I FBI Agent Elsa Myers finds missing people. She knows how it feels to be lost. Though her father lies dying in hospital, Elsa can not refuse a call for help. A teenage girl has gone missing from Forest Hills, Queens. As the hunt for Ruby deepens into a search for a man who may have been killing for years, the case starts to get underneath Elsa's skin. This is another book that features multiple points of view. It also tells about both the past and the present . Although the book is well written. I just felt there was something missing. I also found the back story to Elsa distracted me a bit from the main storyline. There was many twists in the book to keep you guessing. This is the first book in a new series called The Searchers. This is the first book in a new series featuring FBI Agent Elsa Myers. The story flicks between modern day as well as to Elsa’s past and the troubled relationship that Elsa has with her mother. I have to admit, it does make for some uncomfortable reading and my heart really went out to Elsa as she is quite a troubled soul. I loved the balance of getting to know who Elsa is and about her past as well as the case she finds herself working on. It is very well laid out so that we really get a feel for This is the first book in a new series featuring FBI Agent Elsa Myers. I loved the balance of getting to know who Elsa is and about her past as well as the case she finds herself working on. It is very well laid out so that we really get a feel for Elsa and exactly who she is as well as how she works. The fact that the story is set over so many days really gives an urgency in reading it. I wanted to know if they were going to find Ruby alive and well and to who was behind taking her. It certainly didn’t disappoint. A Map of the Dark is a great start to a new crime series. It is a compelling read that has left me looking forward to future books in the series. A must read for crime fiction lovers. FBI Special Agent Elsa Myers is very good at her job, but she doesn't know how to deal with her father slowly dying from cancer and demons from her past. She could take time off from work to spend more time with her dad at the hospital, but she knows working is the only way she can cope. It keeps her from dwelling on her memories. She is called to assist on a case. A teenage girl is missing. Elsa pushes her personal life to the side, intent on finding the missing girl before it's too late. At fi FBI Special Agent Elsa Myers is very good at her job, but she doesn't know how to deal with her father slowly dying from cancer and demons from her past. She could take time off from work to spend more time with her dad at the hospital, but she knows working is the only way she can cope. It keeps her from dwelling on her memories. She is called to assist on a case. A teenage girl is missing. Elsa pushes her personal life to the side, intent on finding the missing girl before it's too late. At first, I had a hard time identifying with, or liking, Elsa Myers. Elsa is an excellent investigator and she's driven to solve cases, especially those involving children. But she has some deep emotional scars and is pretty much emotionally unavailable. The story flips from the current investigation to flashbacks about Elsa's childhood frequently. At first, I found the flashbacks a bit annoying. But by the end of the book, those flashes of insight into her past helped me understand the character better. By the end of the book, I liked Elsa as a main character. The development of her character over the course of the story is quite complex. I liked how little bits and pieces about Elsa were revealed as she discovered and followed up on clues in the missing person investigation. A Map of the Dark is the first book in The Searchers series. Book 2, Last Night, turns its focus to Lex Cole, Elsa's temporary partner in A Map of the Dark. Karen Ellis is a pseudonym for crime thriller author Katia Lief. A Map of the Dark is the first book by this author that I've read. I'm definitely going to read more! I liked the character development and slow-build pacing. I saw one aspect of the ending coming...but wasn't quite sure how it would work in with the story. All in all, a very enjoyable crime thriller. It kept my attention from start to finish. I binge read this entire book in one afternoon. I couldn't stop reading! I am looking forward to book 2. Lex Cole was a bit of a background character in book 1 because it focused mainly on Elsa and her past. I'm so curious about how his story will develop in the second book! Elsa Myers is a FBI agent, tasked with investigating the disappearance of a teenage girl in Queens. Torn between sitt A Map of the Dark is a fiercely compulsive read. I sat down to start it, and before I even realised it, I was over halfway through. I just couldn’t put it down. I’m a huge fan of American-based crime thrillers, especially when they have a great cast of characters and an intriguing plot. That is exactly why I loved this one. It had everything I look for, as well as a few surprises. A new series and a new feisty female protagonist, perfect to kick off the new year! Introducing FBI agent Elsa Myers, who is part of the child abduction, rapid deployment division. This novel does read like an episode of criminal minds. But as always, the author has cleverly woven a secret into the novel, which slowly unravels. Elsa is A new series and a new feisty female protagonist, perfect to kick off the new year! Introducing FBI agent Elsa Myers, who is part of the child abduction, rapid deployment division. The novel has various spin-off themes, mainly surrounding the relationships of the central characters. It works well as a basis to set up a series. Elsa is a strong and capable woman, but at time is broken and vulnerable. I am keen to see where the author takes her next! **DNF** I just couldn’t get into this book, and I don’t want to force myself. There’s nothing glaringly “wrong” with it, I just found it.... slow. I gave it nearly 75 pages but I wasn’t finding myself invested in the characters or the plot - I had that feeling that I had to force myself to keep reading, which is no fun. So I’m just going to set this one aside. I received a free copy of this book courtesy of the publisher in exchange for an honest review. This review is also part of the blog tour for A map of the Dark. Elsa Meyers is an FBI special agent, namely for the CARD (Child Abduction Rapid Deployment) division. Ruby Haverstock, a 17-year-old girl has been abducted at the end of her shift working in a Café on Friday evening. Detective Lex Cole, a new to the department Detective who’s just spent three years undercover with Vice is assigned to the case. It is his first child abduction case and he requests the help of Elsa as her reputation for finding abducted children precedes her. Interspersed with the hunt for Ruby are the occasional chapters that focus on the predicament of the captive. They are only short but add a creepy edge to the book as you get a first-hand account of the captive’s situation. There are also some short chapters that act as interludes from the present day narrative and take us back in time to Elsa’s childhood and her traumatic memories. Set against the backdrop of the abduction case is the story of Elsa’s father, Roy, who has recently been diagnosed with terminal lung cancer and sadly, doesn’t have long left to live. Elsa’s younger sister and her teenage niece are also dealing with this heartbreak making for an interesting family dynamic and relationship between them all. A Map of the Dark isn’t purely an abduction story and the sole focus isn’t just on the kidnapping of Ruby. The book is as much character-driven as it is story-driven with Elsa’s character and her past playing a large part in the story. For me, this is where A Map of the Dark really excelled with the characterisation of the main character adding an extra layer and depth to the book. Elsa is a complex and damaged character suffering from her own familial secrets and personal demons and is haunted by her past. However, it’s also those same demons from her childhood that now drive her and Ellis does a stellar job of showing with Elsa how a person’s past, no matter how long ago can affect their present. The story told in A Map of the Dark is both well-executed and well-written by Ellis who never glorifies the subject matter that she deals with. The hunt for Ruby is a race against the clock and at times it can be harrowing especially as the story progresses and more about the kidnapper is revealed. Then you also have the revelation that Ruby’s abduction might not be the isolated and solitary case that it was thought to be and that it might, in fact, be the latest in a long line of abduction cases perpetrated by the same person dating back years. Add in plenty of twists and turns along the way (one revelation near the end is shocking) and as Ellis builds to the conclusion, ramping up the tension you will find yourself gripped and constantly turning the pages. I was fortunate enough to receive an ebook copy of this book, which is the first in The Searchers series, from the publisher via NetGalley while they are promoting the publication of book two: Last Night. Many thanks for a good read! A Map of the Dark introduces Special Agent Elsa Myers of the FBI Child Abduction Rapid Deployment division. Elsa is requested to look into the case of a missing teen named Ruby Haverstock from Queens, NY, who disappeared one night while leaving her job at a local ca I was fortunate enough to receive an ebook copy of this book, which is the first in The Searchers series, from the publisher via NetGalley while they are promoting the publication of book two: Last Night. Many thanks for a good read! A Map of the Dark introduces Special Agent Elsa Myers of the FBI Child Abduction Rapid Deployment division. Elsa is requested to look into the case of a missing teen named Ruby Haverstock from Queens, NY, who disappeared one night while leaving her job at a local cafe. But Elsa is torn about taking on the investigation because her father is in hospital in Sleepy Hollow, dying from cancer. Elsa, who had an abusive mother who was found murdered in their home when Elsa was a child, is understandably very close to her father. Because of the childhood abuse, she is quite damaged both emotionally and physically. But she does take on the case--if nothing else, it is close to home. She can't keep herself from returning to her family's old home which has now been sold and is undergoing renovations. What does she hope to find there? Closure? Or some kind of evidence? Elsa works with a NY Detective named Alexei Cole and soon the two are deeply involved in police procedures. What they learn is shocking and will soon become more personal. When I received my copy of A Map of the Dark I was intrigued as the dark cover suggested the sort of gripping crime thriller that I usually devour but I hadn’t ever heard of Karen Ellis before. So imagine my surprise and delight when upon reading the inside of the cover, I realised that Karen Ellis is a pseudonym used by Katia Lief! “Who?” some asked when I started to jump up and down with excitement on social media but I soon explained that I am A HUGE fan of Katia Lief and have been for a very When I received my copy of A Map of the Dark I was intrigued as the dark cover suggested the sort of gripping crime thriller that I usually devour but I hadn’t ever heard of Karen Ellis before. So imagine my surprise and delight when upon reading the inside of the cover, I realised that Karen Ellis is a pseudonym used by Katia Lief! “Who?” some asked when I started to jump up and down with excitement on social media but I soon explained that I am A HUGE fan of Katia Lief and have been for a very long time. I have read all of her books including her Karin Schaeffer series. I often checked back on Amazon to see if she had anything new out and always came away disappointed. But now she has a new name, a new series and one of the best introductions to a new protagonist that I have read in A very long time! FBI Agent Elsa Myers has been called away from her father’s deathbed to lead the hunt for a missing girl. There is an Amber Alert out but she knows that those first few hours are the most important when a child goes missing. Even though Ruby is nearly 18 and an adult, it becomes obvious quite quickly that she has been taken against her will. Elsa has to work fast to find Ruby but when the search threatens to take a dark turn can Elsa put aside her personal demons to do the right thing? Elsa was such an engaging character that I found myself totally overcome by her backstory, even more so than the details of the case she is putting her heart and soul into at times. She came across as a strong and independent role model to her sister and niece but behind that shield there was an emotionally damaged, flawed woman who struggled to lay rest to the past. My heart went out to the younger Elsa we meet in the flashbacks as I got first upset and then extremely angry about the failure of her family to keep her safe. As the search for the missing girl unravelled, so did Elsa’s hold on her own emotions as she tried to keep those she loved safe from harm, a luxury not afforded to her by the people who should have known better. This books packs a punch, grabbing the reader from the very first page and keeping them gripped by its compelling storyline until that final emotional ending, leaving me desperate for more. The complex family relationships are explored with a gentle needling contrasting with the intensity of the friendship between Elsa and her colleague Lex. This was one pairing that worked perfectly for me as they developed their new partnership with a mutual respect and understanding of each other. I was thrilled to bits when I realised this was the start of a new series and I hope Karen Ellis continues with the same mix of crime solving and personal development of her intriguing characters as she has with A Map of The Dark. This has been one of the most unexpected pleasures of my reading year so far and is shaping up to be one of my most favourite series so I can’t wait for book 2! Loved loved LOVED this book and if you’ve enjoyed books by Katia Lief, Lisa Gardner or Karin Slaughter then I guarantee you will love it too. Karen Ellis, pseudonym of author Katia Lief, releases a thriller mystery tale focused on a special agent with a disturbing past and a kidnapping of a teenager. One part police procedural and one part thriller, A Map of the Dark is a fast-paced story that delivers an emotionally-charged and highly personal hunt. Elsa Myers is not your typical FBI agent. While her father is hospitalized with an illness that seeks to steal his life, she is assigned You can find my review on my blog by clicking here. Elsa Myers is not your typical FBI agent. While her father is hospitalized with an illness that seeks to steal his life, she is assigned to take on a child abduction case that dusts off all the devastating things she has been through in her own childhood. The story features multiple point of views, as well as both past and present narrative. Chapters that explore the past of Elsa Myers especially highlight the protagonist’s damaged-self through her past relationship with her mother as well as the present residuals of her trauma. Short and extremely concise, they don’t make for an easy read with Karen Ellis’ ability to write convincing and powerful scenes showing us the consequences of abuse. Although these chapters set in the past were interesting in making us further understand our damaged protagonist, they were oddly integrated and never truly felt fluid in the narrative. It didn’t help that there were also a couple of chapters interspersed within the story that offered readers the perspective of the kidnapped. As much as I wanted to truly enjoy this case, I felt like background of the main character overshadowed the main investigation and diluted its thrill. However, Elsa Myers was still a complex character whose baggage isn’t easy to read about. Her flaws are put in the foreground and became the main focus, and that unfortunately took away from the crime story that was being told. Karen Ellis has an excellent writing style that is absolutely captivating. I did see the main twist coming that made the story accelerate considerably a little after the halfway mark, but the author delivers it masterly. In fact, I found that the action towards the end was remarkably developed. I won’t lie that it had me flipping through the pages at an uncontrollable speed. But everything before that twist felt like mud instead of water. It simply wasn’t easy or exciting to swim through. A Map of the Dark is a great new series to check out with its exploration of abuse ambitiously integrated within this child abduction story. The first in a new series, we get introduced to Elsa Myers. FBI Agent who is put on a child abduction case all while dealing with her dying father which is trudging up memories of her traumatic childhood. As each day passes without finding this young girl, her memories start to infiltrate her mind more and old habits of coping come to the surface again. I'll be honest, I had a little bit of a hard time getting through the first third of the book. I wanted to put it down several times and contemp The first in a new series, we get introduced to Elsa Myers. FBI Agent who is put on a child abduction case all while dealing with her dying father which is trudging up memories of her traumatic childhood. As each day passes without finding this young girl, her memories start to infiltrate her mind more and old habits of coping come to the surface again. I'll be honest, I had a little bit of a hard time getting through the first third of the book. I wanted to put it down several times and contemplated DNF-ing. Why? Because it was a little confusing. The prologue gave you a sense of a girl not quite right in her mind but you're not sure why. Ok, I get it. Then we get into the case and the introduction to Elsa. The problem is with the past and present chapters with Elsa. There was some confusion in one chapter where she just calls her mom, Mom, but in others where she calls her Deb... it took me a minute to realize they were one in the same. Also, at a certain point, her past seemed to be more prominent than the real case at hand - the abductions. Then randomly thrown in there, we would get glimpses of the mind of the girl from the prologue, who I assumed was one of the abductees. It just didn't flow well for me. There were also a couple of inconsistencies that glared at me but that's just me being super picky. So, why did I continue? Because I DID get drawn into the case. I needed to know where the girls were and if and how they were going to get saved. Karen Ellis drew me into Elsa's character but I did find myself mulling through the past chapters antsy to get to the present day. By the last third of the book, I was hooked and powering through the pages. I was engaged and empathetic to Elsa, even her past! And while I did see the twist coming a mile away, the author did it well and by the end, I DID feel satisfied. If only I didn't trudge through the beginning, I would be raving about this book. The author is clearly talented and maybe it took all that trudging to truly appreciate the end... who knows? Maybe it's just me and those little inconsistencies just rattled me a bit. At the end of the day, I'm glad that I did finish the book and felt satisfied by the end. I will definitely pick up some more of the author's work in the future (as this is a pseudonym, I'll be looking for some of her work under Katia Lief as well) - and I would honestly like to see where Elsa goes from here. A Map Of The Dark is an unusual psychological thriller as it doesn’t just focus on the kidnapping and the fate of the victim. Instead there is a lot of character development, particularly in the first half of the book. We learn more about Eliza’s past in particular her childhood which was quite traumatic at times and the fraught relationship she had with her mother. This is done in a series of flashback which is interspersed with chapters regarding the ongoing investigation and are quite harr A Map Of The Dark is an unusual psychological thriller as it doesn’t just focus on the kidnapping and the fate of the victim. Instead there is a lot of character development, particularly in the first half of the book. We learn more about Eliza’s past in particular her childhood which was quite traumatic at times and the fraught relationship she had with her mother. This is done in a series of flashback which is interspersed with chapters regarding the ongoing investigation and are quite harrowing to read at times. Eliza is definitely a complex character but one that I found myself warming to more as the story unfolded and I learnt more about her. It was quite poignant to learn about how her childhood still affects her in her everyday life, even when she is at the top of her game work wise. Most of the time she comes across as being quite confident and able but she has moments of self doubt due to her experiences which make her seem quite human. It was heart breaking to read about the coping strategies she had in place for such occasions and how little things could floor this otherwise very confident women. Her partnership with Lex seems very well suited, particularly when the reader starts learning a bit more about his history too. I enjoyed reading about their partnership and how they dealt with the case throughout the book. The story is quite dark due to some of the subject matters discussed and is quite chilling in places, particularly when it becomes obvious that not everything is as it first appears regarding Ruby’s disappearance. Not everyone is telling Eliza and Lex the truth which adds a very intriguing edge to the story as the reader tries to figure out what is happening and why supposed friends and witness are lying. This is the first book by Karen Ellis that I have read and it will be interesting to see where this series goes next. Her writing reminded me a bit of Sarah Hillary as it was quite character driven and emotional which is similar to her writing I felt. The focus on the characters made the book more interesting then a normal crime book as I felt I was more invested in what happened to the characters and that I cared more about what happened to them. Marketed for fans of Karin Slaughter and Tess Gerritsen (two of my favourite authors), I was incredibly excited to read A Map of the Dark by Karen Ellis. Unfortunately, with the comparison to these thriller powerhouse authors, I was expecting graphic suspense and “on the edge of your seat” pacing. This novel had neither of these things. The novel, the first in a new series, introduces us to FBI Agent Elsa Myers- a woman who specializes in child abduction cases and has a past full of demons. When Marketed for fans of Karin Slaughter and Tess Gerritsen (two of my favourite authors), I was incredibly excited to read A Map of the Dark by Karen Ellis. Unfortunately, with the comparison to these thriller powerhouse authors, I was expecting graphic suspense and “on the edge of your seat” pacing. This novel had neither of these things. The novel, the first in a new series, introduces us to FBI Agent Elsa Myers- a woman who specializes in child abduction cases and has a past full of demons. When a young woman is abducted, Elsa must balance her work life and personal life to find the missing girl while dealing with her own battles. This book had a few moments where I felt like I couldn’t put it down. I did like Elsa at the beginning and I did enjoy the different workings of the police case. However, more often than not, I felt like parts were dragging. This novel was so incredibly slow. I struggled throughout the whole thing. I also felt a little bit confused in regards to the narrative style. Elsa goes back and forth between the present and memories of the past. These happen without any warning and I found I struggled to keep up. It took me right out the moment. I also really did not like the amount of personal life that was introduced. Most of the novel was Elsa grieving her father’s cancer and her lost childhood. There really wasn’t investigating involved. I found myself feeling this one was a bit mismarketed. It really didn’t feel like a mystery thriller or a police procedural; instead, it felt more like contemporary family drama with a bit of mystery thrown in. Overall, if you are looking for a new police procedural to bury your nose in this January, I think this one will disappoint you. However, if you are interested in the inner workings of a family, then this one may appeal. Personally, it missed the mark. Overall, I wasn't a huge fan of this book. I liked the storyline and the police procedural aspect of the plot. The writing was of good quality, but I just had a hard time with the narration style and didn't understand certain aspects that the author was trying to convey. I found it difficult to focus on the main plot because of the backstory of the main character, Elsa. It was so distracting, and I didn't see a connection between the two that I'm used to reading. I didn't feel that the teenagers Overall, I wasn't a huge fan of this book. I liked the storyline and the police procedural aspect of the plot. The writing was of good quality, but I just had a hard time with the narration style and didn't understand certain aspects that the author was trying to convey. I found it difficult to focus on the main plot because of the backstory of the main character, Elsa. It was so distracting, and I didn't see a connection between the two that I'm used to reading. I didn't feel that the teenagers in the book were well represented or realistic. As for Elsa, the main character, there were times that I found her likable, and then times where I just didn't want to bother with her. I had a lot of trouble picking up the book to read it. I enjoyed the multiple twists and turns that the story offered, but felt that so much time was invested in developing Elsa's character and exploring her past. As much as I understand the reasoning behind this, I was hoping for more focus on the mystery of missing teenager, Ruby. Thanks Netgalley for this book. Sometimes you find, amidst all the 'new and wonderful series' a book that marks the start of a series you think you will really like. This is such a book. Elsa Meyers is a complex person with a complex background, and the story is sometimes quite complex too. It is very well written in a clear style, and besides the fact that it is a good book, it gives you food for thought. Sometimes it even brought a tear to my eyes. And it is not every day that I read a book that Thanks Netgalley for this book. As the excerpt says this looks as an ordinary missing girl case for this new series featuring a female lead character, an FBI agent, Elsa Myers, but there are other complexities, other darkness indoors waiting to lurk its head out, other truths that wait and you feel the intensity at times of something coming and this keeps you reeled in and immersed in the tale. The fragility of this agent and her past brought before the reader in unfolding events and a series of flashbacks to her terrible mother daughter relationship. She is captive of the dark past within, a release somehow wanting, and with an ailing father with cancer needing attention she needs to focus on the discovery of the missing girl, battling with past and present some resilience to move in right direction in a map of discovery sought, a map of dark things may just come to fruition. Time is of essence, a sense of things slipping away from her, her own web of permeant reminders must be subdued, as the the chapters that mark the days mount, chances of the missing being alive shorten. This is a psychological tale that has you intertwined in the discovery of Elsa’s troubled past and her dealing and coming to terms with that, with her competent outer but fragile inner self and then also the safety of the missing. There are maybe one or two things in this story that do not feel plausible in reality. The writing, easy flowing, visceral, and the psychology mystery has you reading on in some compelling and accessible thrill. A quick read. Just ok. Nothing great. A big thank you to Mulholland Books for the advanced copy in exchange for my honest review! Not going to lie, this cover is what drew me to this book. I saw that it was a police procedural and a mystery thriller, so that was all I needed to know before diving in! A MAP OF THE DARK by Karen Ellis as an eerie atmosphere about it and I really enjoyed that, plus it's book one of a new crime series! "A girl, missing. A woman, searching. A killer, planning"
Elsa Myers is an FBI Agent that specializes in A big thank you to Mulholland Books for the advanced copy in exchange for my honest review! Elsa Myers is an FBI Agent that specializes in finding missing people. Her being assigned to a case of a child abduction couldn't come at more inconvenient time. Her father is sick in the hospital and battling for his life. However, she cannot refuse the call to help find a teenage girl that has disappeared - the first few hours are the most critical. Trying to track down a killer and save Ruby will prove to be difficult for her, because she may have to come face-to-face with her dark past that she has tried so hard to repress. I will say that I struggled with the first portion of this book. It was slower and some parts felt all over the place, but I was drawn in by the case. The case of finding Ruby was so intriguing and is what kept me reading! The second portion of the book really started to pick up the pace and pulled me in even more. Ellis created a great female lead - she's a strong character but she has her flaws that make her feel more human. I really enjoyed the ending and felt that everything tied together nicely for the conclusion. Overall, if you want to start a new crime series, then A MAP OF THE DARK would be a good one to pick up! If you don't mind a slower build at the beginning, then you'll enjoy this one - just know that it does begin to pick up towards the end. I definitely want to see more of Elsa Myers, so I'll be keeping my eyes peeled for more. Loved this! 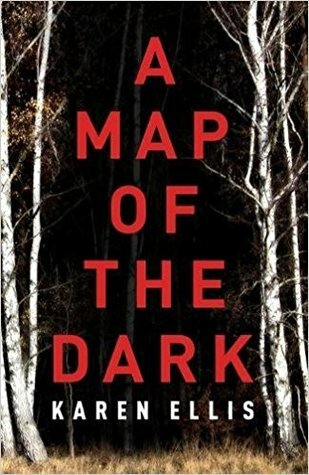 A map of the Dark has a super lead character (FBI Special Agent Elsa Elsa Myers) who harnesses her own demons in order to help solve the case of three missing girls. I couldn't get up from my chair until I'd read it all! The writing is more introspcective than most popular thrillers, so be prepared to take a little time for the story to get rolling - but it's well worth the effort. Five stars, all the way. A Map of the Dark's story line was similar to Gillian Flynn's Sharp Objects. Rather than a reporter who likes to cut herself A Map of the Dark has a detective who is a cutter. They both have troubled pasts and are trying to find missing girls. With a story line that was so similar the only thing that saved this book for me was the back story and family life of FBI Agent Elsa Myers. A Map of the Dark moves between Elsa's life and the missing girls. At times it would take a few sentences into the A Map of the Dark's story line was similar to Gillian Flynn's Sharp Objects. Rather than a reporter who likes to cut herself A Map of the Dark has a detective who is a cutter. They both have troubled pasts and are trying to find missing girls. With a story line that was so similar the only thing that saved this book for me was the back story and family life of FBI Agent Elsa Myers. A Map of the Dark moves between Elsa's life and the missing girls. At times it would take a few sentences into the new chapter before I could decide if it was about Elsa's terrible back story or a missing girl. The relationship between Elsa Myers and Detective Lex Cole reminded me a lot of the tv show In Plain Site. Did anyone else watch that show? I loved it! I couldn't help but picture Mary Shannon and Marshal Mann's characters as I read this book. I liked Elsa and Lex's characters enough to read the next book in this series (The Searchers) when it's released. Elsa is a special agent who is known for her skills finding missing children. During a time when Elsa should be on leave to watch over her dying father she instead decides to take on a missing child case to help her focus on anything but her terrible childhood and her mixed feelings for the man who could have saved her and prevented her mother's abuse but didn't. "What would her life have been like if this many people had swarmed to the house in Ozone Park in search of her, only to find her huddled in a locked closet? She imagines the relief, the celebration, but wonders if outsiders could really comprehend how lost a child can be inside her own house. At some point you're beyond saving; no one can show you how to unswallow all that darkness." Elsa has been requested by Detective Lex Cole to help her on his case of a girl who went missing. Here's where things got complicated for me. There ends up being two missing girls. Lex and Elsa don't know that right away and the author throws the second girl's story in before the reader knows there is a second girl. This was confusing for me. I had a hard time deciding which girl was which once I realized there were two. Maybe that was the whole idea. It didn't really matter what their back story was. They were girls who were taken by a psychopath that Elsa and Lex were racing to find before it was too late. Elsa family life is messy and complicated and that is tossed into the middle of the suspense of whether or not they will find the girls before it's too late. Spoiler!! I repeat spoiler! If you are going to read this book, don't go any further! Just know that it's a good book and if you are looking for a suspense novel with an interesting female lead A Map of the Dark is a good choice. I really need to talk about the ending. It's not very often that I've read a suspense novel that the female lead slits the throat of the killer. I know that Elsa is a cutter, so she is comfortable with a knife, but I did not see that coming. For some reason it seemed so much more graphic than her shooting him. It was a twist I didn't anticipate and it made this book even better. I guess I feel that way because it broke the mold that these novels tend to be in. Also, I did not see coming that the "home invasion" that ended with Elsa's mother dying wasn't an invasion at all. I thought is was odd that Elsa kept going back to her childhood home that her father had sold and breaking in just to wander around. It was actually starting to annoy me. I however was not expecting that Elsa was looking for the murder weapon that her father had hid from the police. I really didn't like Elsa as a main character. The book is less of a mystery and more of a character study, and while Elsa is a good character, with a back story and motivation, she's also incredibly dislike-able. It would have been nice to have more of the book dedicated to the case, rather than dedicated to Elsa.